With hints of Summer popping up all over the place now, here in the great Northwest, I wasted no time in bringing out my new Summer wedges. What was particularly special about these particular wedges was they were particularly free. Whoopee! Yes, as part of my winnings from Beso.com, I picked them out and had them shipped to me just in time for the spotty warm weather we all complained about delighted in last weekend. While these wedges look like woven hemp, they are actually silky loosely-woven ribbons. The glossy look of the satin ribbons give these casual sandals a hint of not-so-casual style, which I like and could see wearing to more dressy occasions. Still sturdy though and since the heel is a wedge, these are oh-so comfy to stroll in. 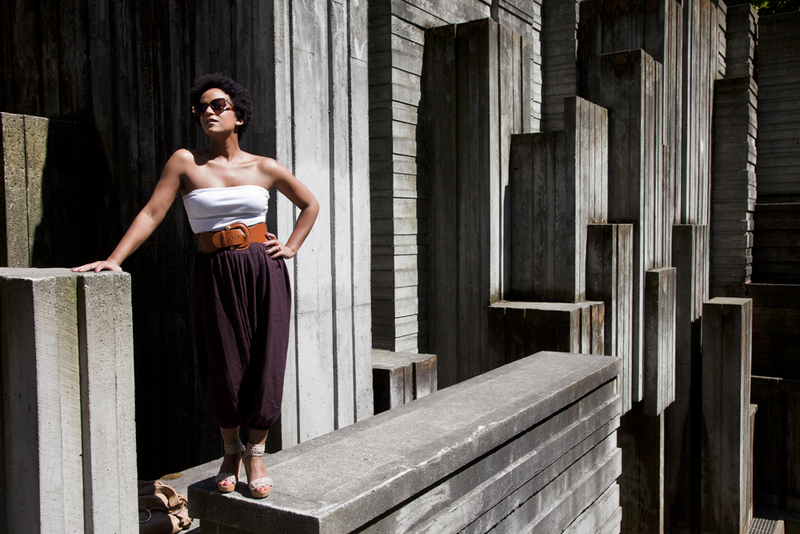 This concrete structure was so fascinating to walk through and look at. I really should have been wearing someone like Gareth Pugh or Comme des Garcon, the way everything felt. The structure had major drop offs and stairs in every direction. Stepping back, it made me think of the handmade cities from Inception, actually. 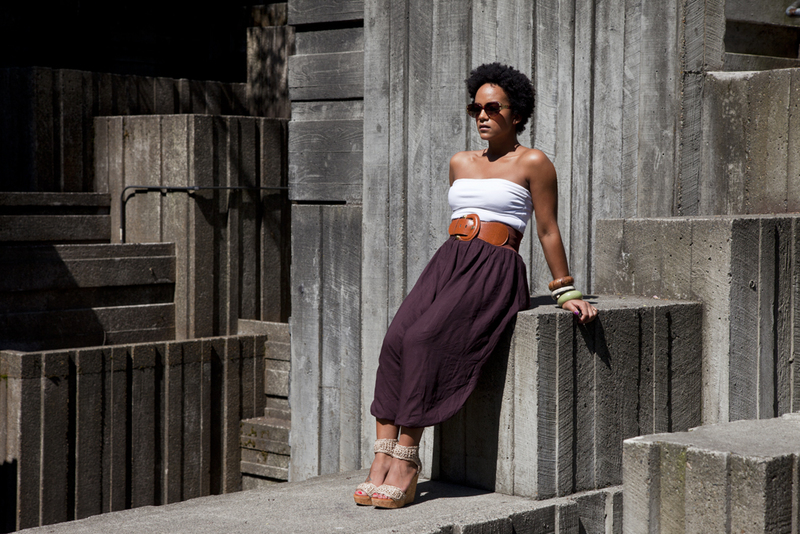 But with the safari-like ensemble I was wearing that day, the background was so inspiring I couldn't help but take some pictures. And the outfit? I just went with it and hoped it would come out as an eccentric contrast. I am not a Summer shoe person by any means. Where I live, Summer breezes by in the form of several weeks. So dropping $100 plus on some cute sandals never sounded worth it. BUT, since I love fashion as much as I do, I've recently chosen to purchase two amazing Summer shoes (each year but only when needed) because when the sun does shine, I don't want to be sulking in flip flops, ya feel me? And, hello - it's not a ludicrous concept: every girl should have at least one pair of fabulous sandals no matter how Tiny her closet is. Done! You have such beautiful skin! These pictures of you are gorgeous. I love those harem pants, the color is very royal. Not into the wedges, yet you wear them with such grace and style. I'm a bit envious :-) Your outfit is truly stunning. Love the entire ensemble! 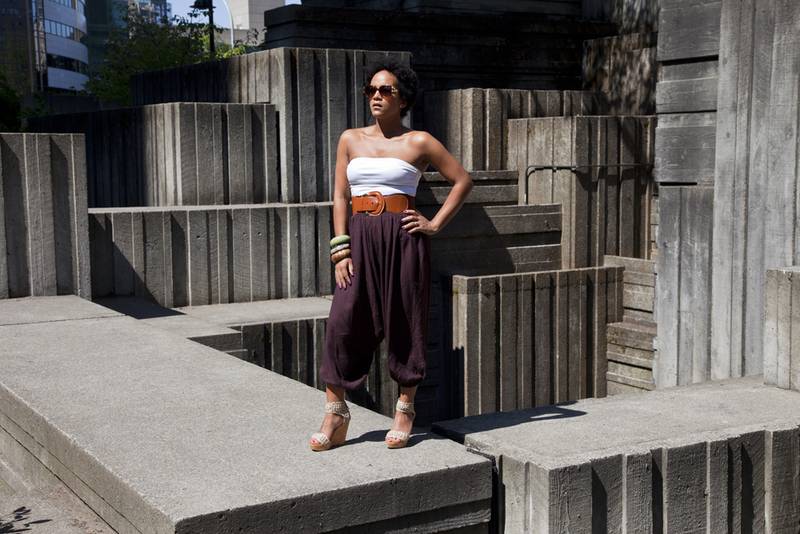 I couldn't carry off harem pants like you, but am luvvvving those wedges! who makes them?